The International Space Station is the most expensive single object ever built by the human race to date. It orbits the earth every 90 minutes, amazingly that 16 times daily. It travels at a whopping speed of 5 miles per second. It is made up of hundreds of major and minor components. Currently it is the third brightest object in the night sky after the Moon and Venus. A total of 16 countries were involved in the construction of ISS which are Norway, Spain, Sweden, the USA, Germany, Italy, the Netherlands, Brazil, Denmark, Japan, Belgium, Canada, Switzerland Russia, France and the United Kingdom. It was taken into space piece by piece and then built in orbit. The systems on the International Space Station are being controlled by 52 different computers. There are two bathrooms, a gymnasium, a 360° view bay window in the space station. Approximately seven tons of food supplies are required to support a crew of three people for 6 months. The solar array wingspan is 240 feet which is longer than that of a Boeing 777 200/300 model. The electrical systems on the ISS include 8 miles of wire. Astronauts on the space station do not sit down for a meal. They just stabilize themselves and float. The internal pressurized volume of the ISS is 32,333 cubic feet. It has more liveable space than a six bedroom apartment. Oxygen comes in the space station through a process called electrolysis. Declan, Tobin. " Fun Facts for Kids About The International Space Station ." Easy Science for Kids, Apr 2019. Web. 21 Apr 2019. 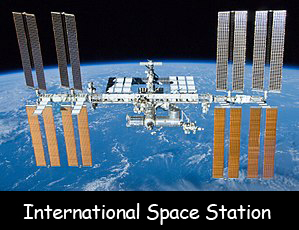 < https://easyscienceforkids.com/international-space-station/ >.